Slip has been a very naughty dog! When we go over to the fishing lake we take a bag of trout pellets to feed the fish with as there is not much natural food about at this time of the year. Slip loves the pellets and tries to grab them out of the bag. Normally John puts the bag away in a shed when we get home. Yesterday he did not. We went out for a drink last night and left Slip in the back of the Land Rover with a biscuit as we normally do. Hmm! When we came back to the Land Rover, the trout pellet bag was overturned and empty! There must have been at least 2 kgs of pellets in the bag – all eaten by Slip. She seems no worse for eating them although I did think her coat looked a little scaly this morning! This is the shade card for the Isager Spinni yarn ( top two rows). Spinni is a one ply yarn that comes in 100g hanks – 610 meters per hank. The third row shows Tivinni Alpaca on the left and Jensen Yarn on the right. 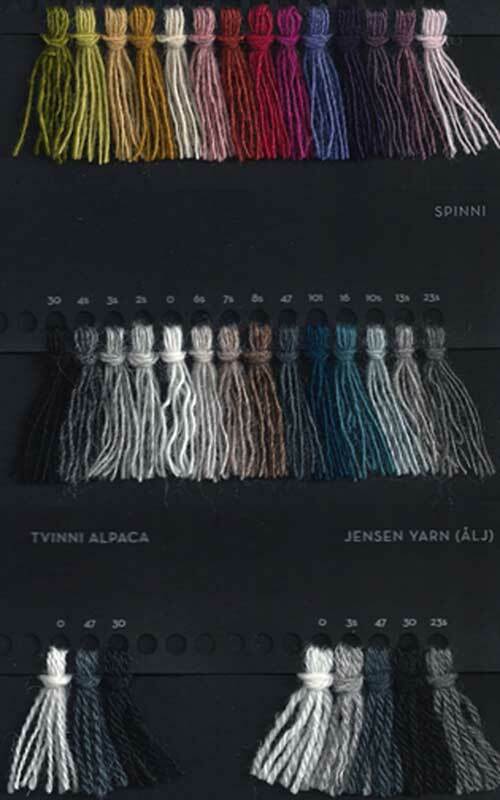 Tivinni Alpaca is 2 ply weight -50% Merino Wool and 50% Alpaca – 550 meters per hank. Jensen is a 3 ply weight wool yarn – 230 meters per hank. Tomorrow I will show you another card! We are going out for a Chinese meal tonight for a change. It is still very cold here and no prospect of much change. John is postponing any trips to Scotland as it is just too cold to stand waist high in cold water! Back tomorrow. Oh, that looks like lovely stuff. I hope you’ll carry the patterns as well as I don’t think I’ve seen them here.